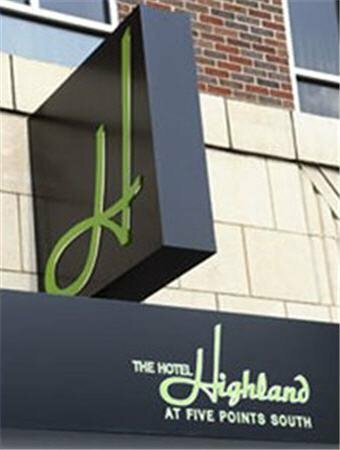 Check Rates & Availability at Hotel Highland Downtown - UAB, An Ascend Hotel Collection Member! The Hotel Highland Downtown - UAB, An Ascend Hotel Collection Member is nestled in the heart of the historic southside of Birmingham just seconds from the University of Alabama Birmingham UAB Hospital and Regions Field. We are also near UAB Blazers, Alys Stephen Center, Workplay, Iron City, Lyrick Theater, Childrens Hospital, Temple Beth-El, Temple Emanu-el, Highland Presbyterian Church, Church of the Highlands, Highland Methodist Church, Avondale Park, Railroad Park, Regions Field, Spain Park, Andrews Sports Medicine and Baptist Monclair Hospital. We offer a free full hot breakfast, WiFi, fitness center, business center and lobby bar. Also, earn rewards including free nights and gift cards with our Choice Privileges Rewards program. Pet accommodation: 35.00 per stay per pet limit 2 pets per room 20 lbs or less Valet parking: 14.00 USD per car, per day. Hotel is 100 percent non-smoking, fee may apply if violated. A $250 deposit is required for cash payments.